A new year encourages new habits. Perhaps you’ve dusted off your baking books, are beavering away with a new hobby, or 2019 is the year you are keen to start living more sustainably. Eco-bricks, plastic-free and sustainability are all buzzwords we’re hearing and at KIDLY, we want to do the hard work for you and track down those earth-friendly items that fit seamlessly into your daily life. 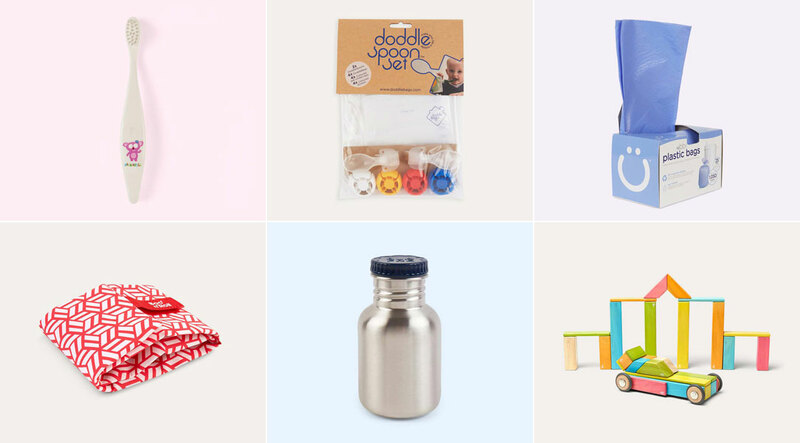 So here’s a round up of our favourite green products for your little ones. Did you know a standard plastic toothbrush takes approx 1,000 years to decompose? Shocking, right! That means every plastic brush that everyone in your household has ever used, still exists somewhere on the earth 😢. Good news. Brands are recognising this harmful waste and are coming up trumps with alternatives. The Jack ’n’ Jill biodegradable toothbrush is one of our faves. Perfect for little hands to get to grips with, it’s a brush that’ll be kinder to the earth once it’s retired from your bathroom shelf too. The average child uses around 4,000 nappies in their lifetime. Quite a number, hey? Add to that one bag per nappy for disposal, and you’ve got a lot of waste heading straight for landfill. If washable nappies aren’t your thing but you want to try and reduce your waste output, maybe switch up the way you get rid of nappies. We love the Ubbi Nappy Bags which replace the standard, individual ones. Designed to fit the brands own Nappy Pail, but fitting most others too. These clever bags, made from 20% recycled material are also biodegradable. Reusable bottles are enjoying a moment and this includes kids drinking bottles too. Easy to keep clean and obviously eco-friendly, there’s a load of steel alternatives to the typical plastic sippy cup coming to market. Contemporary brand Blafre designs simple but strong Stainless Steel Drinking Bottles for the modern kid. If your little one struggles with an open topped bottle, pair it with the straw top, for a leak-free, easy-flowing time. This waste reducing product is one you may like for yourself. The Roll'eat sandwich wrap is a handy little lunchbox addition to keep sarnies fresh. Say goodbye to those fiddly rolls of film, that you just can’t ever find the end of, and instead, pop your little ones sandwich of choice into this pocket. Simply wipe clean between use or pop them in the washing machine, if it’s been a particularly mucky filling. They’re more eco-friendly than cling film and foil and a whole lot speedier too. Waste isn’t just about chucking stuff away. Living sustainably is about living in a way that reduces what you need to buy. We’re all about introducing toys for kids that have longevity and will entertain them for longer than it takes you to make a cup of tea. Sustainable brand Tegu, design super clever, magnetised blocks, ideal for little ones from 12 months. Tegu is simple, but it’s well-made, it’s ethical and it’s the kind of product that’ll be a toy box favourite right up until school age - and beyond!